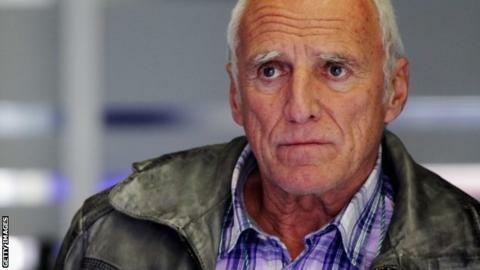 Red Bull owner Dietrich Mateschitz says his company could quit Formula 1 if he is not happy with the way the sport is run. His remarks follow Red Bull driver Daniel Ricciardo's exclusion from the Australian Grand Prix and the adoption of new rules. Mateschitz said Red Bull's future in F1 was more "to do with sportsmanship and political influence" than finance. He said: "In these issues there is a clear limit to what we can accept." He also referred to the "inappropriate politicisation" of the sport. Red Bull have appealed against Ricciardo's exclusion from the season-opening race in Melbourne for using more fuel than is allowed under new rules. The appeal is to be heard on 14 April. Mateschitz has great influence in motorsport. He owns two F1 teams and has been instrumental in keeping the world rally championship alive through his company's investment. His remarks were made in an interview with the Austrian newspaper Kurier, in which he was asked under what circumstances Red Bull may end its involvement in F1. He replied: "The question is not so much whether it makes economic sense but the reasons would be to do with sportsmanship, political influence, and so on. "In these issues there is a clear limit to what we can accept." Mateschitz did not expand on his answer but Red Bull's involvement in F1 revolves around its two teams, Red Bull Racing and Toro Rosso. It is also promoting its own race for the first time this year, with the return of the Austrian Grand Prix at the Red Bull Ring. Asked if he felt his acceptable "limit" had been exceeded as a result of F1's new rules and Ricciardo's disqualification, Mateschitz said: "The team has lodged a protest. The fuel-flow sensor, which was given to the teams by the federation, gave divergent readings and it is inaccurate. We can prove the exact amount of fuel flow and this was always within the limits." Governing body, the FIA, warned Red Bull in Australia that all teams had been told they must stick to the readings given by the official sensor. Red Bull ignored the readings and ran the car according to readings given by their own measurements. The FIA has said that these can be used if it feels a sensor has a problem, but this permission was not given to Red Bull in Melbourne. Mateschitz also criticised the new format of F1, both in terms of the use of a fuel limit and in the sound produced by the turbo hybrid engines, which are much quieter than last year's naturally aspirated V8s. "You have to make F1 like it used to be - the top discipline of motorsports," he said. "F1 is not there to set new records in fuel consumption, nor to make it possible to have a whispered conversation during a race. "It is absurd to race a lap seconds slower than last year. GP2 partially provides more racing and fighting and almost equal lap times as F1 with a small fraction of the budget." Red Bull's four-year dominance of F1 has been ended by the new formula, which has lessened the effect of aerodynamics - in which the team excelled - and brought back engine performance as a differentiator. Red Bull's engine partner, Renault, is significantly behind Mercedes in both outright power and fuel efficiency. Mateschitz insisted Red Bull would be able to challenge the factory Mercedes team before long. "The work with Renault continues around the clock," he said. "In the next two or three weeks we will make a big step and reduce the gap to Mercedes. There are 18 races still to go. We will be back."